little bird charm at the craft store. It's 14 millimeters by 18 millimeters. You'll also need a crystal bicone. Ours is blue and it's three millimeters. rings. Our jump rings are open jump rings, which means they're not soldered closed. also going to use our chain nose pliers. and that means it's not soldered closed. But of course we need to open it still. rotate it until I can see where that opening is. There's a little slit there. that that jump ring is closed. the charm on the chain and this is almost a necklace, but it needs a clasp. the jump ring is open so I can slide something on to it, but it's still round. only thing we need to do now to finish this is put a jump ring on the other end. how cute this is. 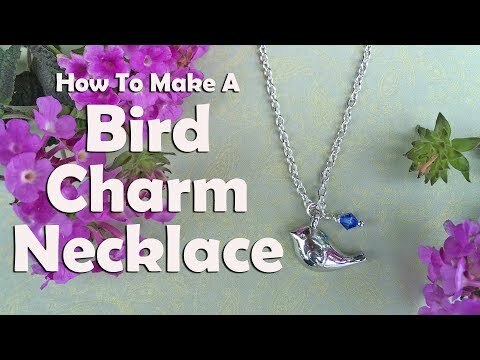 This delicate little bird charm necklace.